First Grade Lunch Buddies 3/20/2019 at 11:30 am. 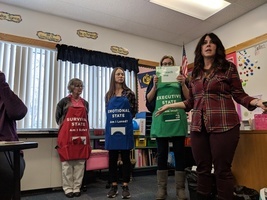 PTA Meeting tonight 3/19/2019 at 6:30 pm. Welcome NAIA Women's Basketball from Vanguard University! Wear Blue & Gold on Monday, March 11...GO VU Lions! Best of luck to our 10 finalists for the Blue Creek Spelling Bee! This will take place February 21, 2019 at 6:00 pm in the school gym. Participants are from grades 4, 5, and 6. they will compote to be the Blue Creek Bee champion and a chance to compete at the Yellowstone County Spelling Bee. The 2019 Science fair will be April 3, 2019. Information went home with interested students. Fourth grade is required to participate in the science fair as part of their science curriculum. Please contact Mrs. Mehelich with questions at mehelich@bluecreekschool.org. You can access the entry form by going to Menu on the BC homepage, to documents, to Science Fair. Blue Creek School, District #3, Board of Trustees Notice of Regular Meeting Thursday, December 13, 2018 at 6:30 p.m. Reminder from PTA: Please continue to sell, sell, sell!! Order forms and money need to be returned to school by this Thursday, November 15th! Blue Creek School, District #3, Board of Trustees Notice of Regular Meeting Wednesday, October 10, 2018 at 6:30 p.m. This is the Board’s regular meeting for October which will be held at a different day than usual upon unanimous consent of the Board. We are in need of 2 volunteers to help with school pictures on Friday, October 12th. Please call the front office at 259-0653 if you are interested. You will receive a free picture packet to use for one of your students as a thank-you. 5th and 6th Grade Girls Basketball begins 8/28. All forms must be turned in to practice. 5th grade 3:30-4:30 pm 6th grade 4:30-5:30 pm With this quick turn around please be sure to be on time to pick up your player. Class Lists will be posted in the front entry windows after 4:00 pm 8/10/2018. Blue Creek School, District #3, Board of TrusteesNotice of Regular MeetingThursday, July 12, 2018 at 6:30 p.m.
School Board Meeting Thursday, June 14, 2018 at 6:30 pm in the school gym. 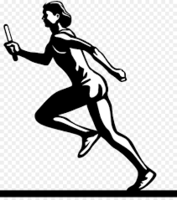 Summer Vacation runs June 1, 2018-August 21, 2018 Have a fun and safe summer! Field Day is tomorrow, May 16th!! It will be warm and sunny, so remember to bring your water bottle and sunscreen!! Also please remember that shoes must properly cover feet for safety reasons....playground equipment and the blacktop surfaces are not kind to sandals!! Shoes exposing toes are not to be worn by students! May 2, 2018 dismiss at 12:00 pm for professional development for staff. 5th and 6th Grade County Track Meet. Contact Mrs. Buckner for details at 259-0653 or buckner@bluecreekschool.org. 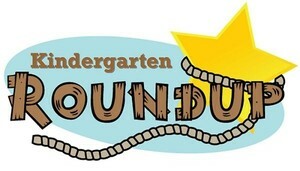 Invitations for Kindergarten Roundup were mailed last week. Please remember to RSVP at 259-0653 or secretary@bluecreekschool.org. Our Roundup is on Friday May 4th from 8:30 to 10:30. Please pass this information on to neighbors who have kindergarten age children (must turn 5 years old by September 10, 2018). Support our Blue Creek Foundation by participating in our annual Fun Run at Riverfront Park on April 21st. Click here to find out more details and to get registered. Early out TODAY! Students are dismissed at 12:00 pm. No lunch served. Staff will be receiving professional development on Differentiated Instruction. School resumes on 2/21/2018 at the regularly scheduled time. Thank you! Due to the weather predictions and safety concerns for our students, their families, and our staff, Blue Creek School, SD3, will be cancelling school for Tuesday, February 20, 2018. 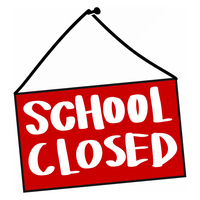 We will resume school as regularly scheduled on Wednesday, February 21st. Early out today! Students are dismissed at 12:00 pm. No lunch served today. Staff will be receiving professional development on Assessment through our curriculum consortium MT ACE (Montana Alliance for Curriculum Enhancement). 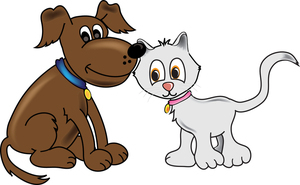 Bring in your donations for our Pet Food Drive! The kids are trying to get 100 pounds of food for pets to be donated to local shelters! They are doing this in conjunction with their 100's Day! Science Fair entry forms for the 2018 Blue Creek Sciecne Fair are due by this Friday, January 19.If you have any questions please contact Mrs. Wagner at 259-0653 or wagner@bluecreekschool.org. What a learning experience with Conscious Discipline and Jenny Barkac! Our staff learned a lot and laughed a little too! Early Out-students dismissed at 12:00 pm. No lunch served. Orchestra is back in action today! Miss Rebecca Strobel is our new orchestra instructor. She can be reached at rstrobel@bluecreekschool.org. 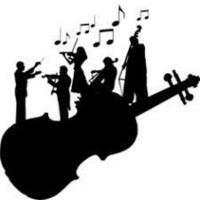 Beginning orchestra is each Monday from 3:30-4:30 pm and Intermediate Orchestra is each Tuesday from 3:30-4:30 pm. We have a regular week next week M-F with normal dismissal time at 3: 15 pm each day! Winter Break is Dec. 25-Jan 2. See you back on Jan 3, 2018!